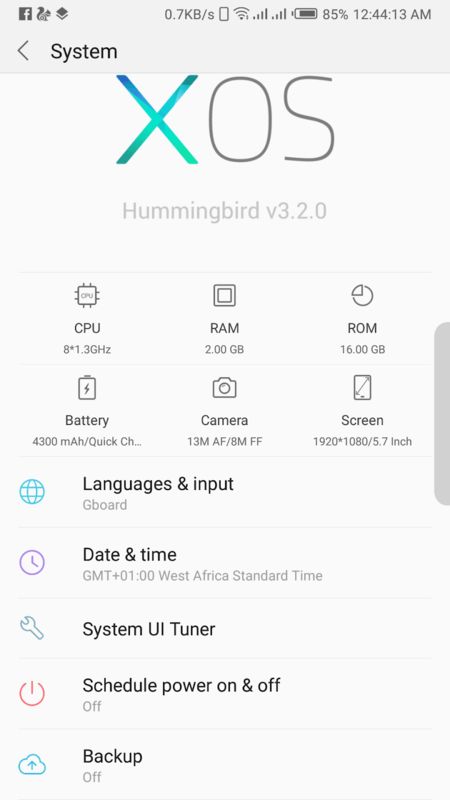 Okay guys, the wait is finally over, and infinix has officially released the android 8.1 Oreo update to all its infinix Note 4 users worldwide, and guess what guys, it also brings along with it the latest version of XOS Hummingbird, the XOS 3.2 Hummingbird. Who is happy. See screenshots below. There you have it guys, the update is currently being rolled out to all infinix Note 4 X572 users around the world, via OTA, but there's no guarantee this update will hit everybody at the same time. So if you've not received yours, there's no cause for alarm, just exercise a little patience, and it will get to you. The update file itself is 1.8GB in size, so make sure you are on a wireless network, and you have enough storage space left in your phone before starting the update, to avoid complicating issues. And for those of us who are wondering if your device wouldn't be getting its own Oreo update.. well i will just have to tell you to exercise a little patience, as update plans are being made for them too. You can read more about infinix devices that will be getting Android Oreo + XOS Hummingbird update this year here.. 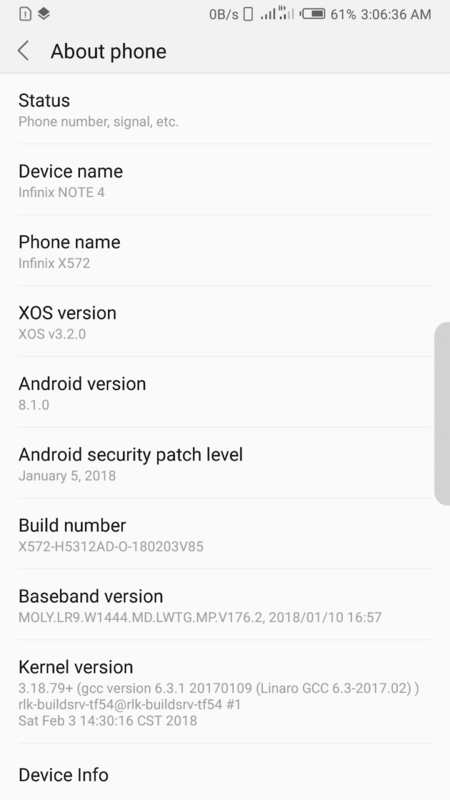 So that is it guys, enjoy the Oreo Version of android on your infinix Note 4 devices, and as well tell us your experience if you've already updated your device, and is using the Oreo version. And as well don't forget to share this article if you like it. Bye. Depuis la mise à jour XOS 3.2, je n'arrive plus à utiliser le partage de données mobiles ni de faire des screenrecords. Qui peut m'aider svp? Vous voyez que je ne conseille pas vraiment aux gens d'opter pour cette mise à niveau pour le moment, car il y a beaucoup de bugs, et celui que vous venez de mentionner en est un. Mais nous espérons que toutes ces choses seront corrigées avec une mise à jour du système, alors soyez patient, ou revenez simplement au nougat android. Alot of users are also complaining of this same issue, but a stable version have been released for the Note 4,so try reupdating your phone and i'm sure that should solve the problem. I have updated mine to Oreo and the hummingbird but my problem is that I am unable to take screenshots using a scroll of three fingers like in the previous version. Also, I cannot set my camera into full screen mode like in the previous version. Those two issues are a concern to me now. Tell me how I can sort that out. Bien dit et c'est vraiment dommage. Je ne vois pas l'importance de cette mise à jour. 1-mettre mon appareil photo sur plein écran. 2-mettre mon portable en mode ultra économie d'énergie. 3-faire screen shot avec les 3 doigts. 5-impossibes de faire défiler les images de l'écran de verrouillage. 6-les pop up de notifications de messages sont tellement transparents qu'il est difficile de lire l'information affichée. 7-Pour les appels, le pop up se place au bas de l'écran afin que vous puissiez sélectionnez. 3-le design de l'application de lecture des SMS est plus beau selon mes goûts. Bonjour, je pense que ce sera mieux si vous revenez à votre ancienne version Android, et attendez qu'il y ait une version de mise à jour stable. Thanks for stopping by and i hope i was able to solve your problem sir/ma. Hello bro, we already covered this topic in a seperate article, so in that case, i will like you to follow a link i will be pasting below, it covers every single thing that we think you need to know about the Infinix Xhide. It talks about what it is what it does, how to set it up, some little problems you might encounter with it, and as well how to fix them.. So read it up and tell us in the comments section there, about what you think.. And here's the link below..
just copy the link and paste it in your internet browser's address bar. Is there any update for infinix zero 5? This is so problematic and frustrating at the same time, i mean i waited very long for an update and reported some of the issue but there's no one responding and none of them fixxing the Damm promblem!!! Hello Unknown..there is no update yet.. but an update might be on its way very soon... so just hold on a lil bit more.. don't lose hope just yet.. now's not the best time to lose your precious patience..who knows, you might need it some other time. After installing the update, my phone charges really really slow. I don't know what to do! It is a general issue bro. chill.. Even Infinix made it known on their Facebook page that they're gonna be tinkering with the font faces on some if their smart phones.. so let your mind be at rest.. nothing is wrong with your phone..
And by the way, who still uses fonts on smart phones nowadays..personally i prefer everything to appear normal and the way it should be.. Your preference though.